My trip to Western Flores and the Komodo Islands last July was a grand object lesson in how keen Indonesia is for tourist dollars and how clumsily they go about mining the potential. Mining is the apt metaphor, as the transition from traditional subsistent rural life into international tour hot spot is no different than a series of explosive episodes that tears apart the indigenous order. The poverty in Nusa Tenggara Timur (eastern Nusa Tenggara region- the string of Lesser Sunda Islands east of Bali as stretch out to Timor) is painful to witness, and I really didn't begin to see the worst of it at all. Widespread malnutrition and high rates of infant and maternal mortality are much more evident in the isolated, rural areas, of course. There are two Indonesias- rural and urban, and that is the proper place to begin when attempting to describe the divides and fault lines that characterize the country. When the world of tour and travel descends upon an erstwhile remote region of rural poverty, all manner of both promise and perversity are set into motion. The promise benefits too few, and the perversity affects all. The island of Flores is politically hampered as it is subject to the whims of the provincial governor who is based in Kupang, Timor. The spoils are always meatiest closest to the provincial seat, and outlying areas- especially if they are separate islands populated by different ethnic groups- get the shaft. For geo-historical reasons going back to the days of Portuguese colonization, Kupang developed lasting regional clout, and remains the economic and transportation hub for all of Nusa Tenggara Timur. Flores finds itself in a bind not being its own province. For such a large island composed of so many unique ethnic groups, this presents a host of problems. Not surprisingly, Flores' infrastructure suffers as a result. The roads that traverse the mountainous terrain between major economic and population centers on the island are well-paved, which was surprising, but Labuan Bajo, the port town on the western tip which serves as gateway to Komodo is for the most part a filthy, dilapidated mess. A study in contrasts, street peddlers clinging to the edge of existence are found sitting on garbage-strewn dirt patches along the main drag next door to fashionable foreign-owned, upstairs bar-restaurants offering WI-FI, grilled tuna, oven-baked pizza and cold beer. Much of the clientele are hyper-tanned, tattooed tourists with iPods plugged into their aural orifices, distantly staring into their smart devices or surfing the net on their portable lap tops. Meanwhile, brilliant sunrises ushering in the day along an incomparably beautiful coastline are blighted by plumes of toxic smoke rising from a hundred piles of burning garbage scattered around the small seaside city. As the high-pitched whine of promotion on television and the internet tout Komodo as one of nature's seven wonders, its point of access is a town heaped in garbage while the stench of raw sewage is found everywhere. The docks are dangerous to navigate by foot, the roads full of muddy pot-holes, and the town full of "calo" (brokers) who are constantly on the take, promising tourists they can get them whatever is needed- a good hotel, a boat or car for hire, or a teenage girl for pleasure. The prostitutes were rather hidden from view, but the pimps strutted like peacocks around town with zestful abandon. The sudden influx of Euros and dollars has imbued Labuan Bajo with madness akin to gold fever. A peculiar and predictable Indonesian-style social/work structure as found in rapidly growing tropical tour hot spots has quickly been instituted. Many of the indigenous poor and uneducated don’t qualify to serve tourists as they don’t speak English, or look the part, and if they can find work, are paid slave wages. More well-groomed and educated vocational school interns pursuing tourism degrees are shipped in from inland Ruteng for brief stints of two and three month work rotations. These young people accept this as part of their educational program, and the hotel owners of Labuan Bajo benefit as they aren’t obliged to pay them. Room and board is payment enough as negotiated by school officials. The sheer volume of boats moored offshore in Labuan Bajo is staggering, approaching a thousand in number. They range from small traditional fishing boats to mighty wooden pinisi live aboards that transport well-to-do tourist divers who pay thousands of dollars a week to glide across the great archipelago and plumb its colorful depths. The small port town presents itself as a fisherman's paradise. A maritime reserve protects large zones which insure eco-tourism, fueled mainly by diving dollars, but makes survival for small fisherman ever the more difficult. A growing Muslim population is ghettoized as crammed into substandard housing that crowds the beaches, most of the inhabitants being subsistent fisherman and their families. The indigenous Manggarai of Western Flores (almost 100% of whom are Catholic) are prone to sharing cheerful greetings with foreign tourists walking down the street while ostensibly displaying the Javanese ethos of "nrimo" which speaks to the willing acceptance of life's harsh hand as dealt. Meanwhile, the mercantile class(es) of Indonesia, an amalgam of a few traditionally enterprising ethnic groups- the Indo-Chinese, Bugis, Torajan, Butonese; Batak & Miningkabau from Sumatra- swoop in from the outside with a lot of drive and some capital, taking advantage of the budding business opportunities. Padang-style restaurants, over-priced hotels offering poor service and oft-reported ungracious treatment, along with tropical island restaurant-bars catering to the beautiful people, partying jet set tourist crowd are the result. The posturing of Bob Marley impersonating, self-anointed hip-Indonesians who take pride in pandering to foreigners at the local drinking holes is akin to the inimitable Kuta Cowboys of Bali- wanton and brazenly transparent. No harm, no foul I suppose as it is a masquerade; a well-recognized form of island entertainment which doesn’t appear to fool anyone, and is a peculiar brand of symbiosis that apparently self-satisfies the parties involved. The local government officials rake in hotel and restaurant taxes while figuring out ways to capitalize on the growing hordes of tourists through their myriad tools of corruption while giving little if nothing back to the community in terms of infrastructure development. The docks remain in sometimes gross disrepair and are neglected. One misstep while descending steep concrete stairways off the docks and onto a small boat and you’ll find yourself in the drink unconscious from a blow to the skull. Facilities for sanitation are non-existent, and as with most of Indonesia, garbage is thrown anywhere, everywhere, and sewage runs through drains untreated directly into the sea. The treatment of tourists is often abysmal and shamelessly mercenary, and is the price to be paid for a taste of paradise. It is reminiscent of Gili Trawangan in Lombok and modelled after the Balinese who set the gold standard for such behavior. The Balinese must be admired for their sophistication, though, as they have had a lot of practice. Their clever, imaginative ways provide good grist for the experiential mill if such things still hold interest for anybody self-respecting. The biggest difference is that there are no flower-scented toilets to speak of in Labuan Bajo. The Manggarai locals are left high and dry and clueless in the dizzy, transformational rush as tourists fly into Labuan Bajo's quaint country airport in greater numbers seemingly every day. And self-admittedly, I was just one more of that growing crowd, even though I pressed my conscience to define my status as “otherwise” simply due to the fact I lived in the country, a responsible journalist, and could speak the national language. I can tell you that in the final analysis that amounts to just so much diversion and doesn’t cut it a twit. Outsiders- both foreign investors and Indonesians- have walked into town and set up shop to serve the burgeoning tourist boom while an older way of life is sidelined. Life in Western Flores is changing with rapidity hard to measure. In the wake of this once-in-a-millennium change, the indigenous Manggarai are being left behind both culturally and economically. Some of the more eco-seeking tourists make a beeline out of Labuan Bajo for very rustic resorts that exist in small number as located on very small islands that help make-up the greater "Komodo archipelago." Reservations are tough to come by and there is a sense of competition for such scarce resources amongst the tourists themselves. Sharing tour information is hence a little bit more close to the vest as found in most parts of Indonesia. These offshore resorts exist outside of time as it were, so quiet you can hear a pin drop or a fish broach the surface of the sea a kilometer out from shore. I have never visited such silent places in Indonesia. The island-scapes are dry and grassy, rather savannah-like with shade hard to come by. Many visitors to such places are European, and those seeking get-away style isolation take it with dead seriousness. Best not approach them if you are just visiting the island by boat for the day and aren't actually renting one of the bungalows. Certainly don’t get between them and their vacation books which are as thick as dictionaries. This journal is an unsolicited anecdote-as-antidote meant to counter two sources of tour information: number one, the puerile tour promotion pervading Indonesia as self-presented; and number two, the celebratory travel blogs put together by mainly first-time, starry-eyed tourists which project a similar picture postcard reality. To their credit, the photos found in these blogs are worth the time, but the commentary best be skimmed over. But anecdotes are supposed to be entertaining and antidotes curative. It's far from certain this journal qualifies as either. It's predictable copy as true to its source as the sordid facts of life tend to catch my eye. After living and traveling in Indonesia for more than six years, travel is becoming more difficult as knowledge always translates in part into pain. Despite it all, once launched alone on a boat out into the cluster of Komodo's islands one is instilled with a sense of magic only nature can afford. Leaving Labuan Bajo behind in the wake of a slow moving vessel and one can mercifully begin to forget the tawdry nature of onshore tourism. The grand view of the hilly topography that nestles Labuan Bajo comes into proper focus. It is an arresting image that burnishes indelible into permanent, blissful memory. Indonesia is at its best when surrounded by small islands while wending ones way through on the deck of a wooden boat. Many of the otherwise grassy islands and islets are dotted with the plaintive, lonely, slender and spindly-looking lontar palm that is the iconic plant of Nusa Tenggara Timur. The ocean currents are fierce and unpredictable, and can be seen rushing like rivers rapidly changing course as threading their way between islands. As for the sum total experience of geology, flora and fauna, one can feel the pull of Australia, and that these islands had originally broken off from that greater land mass. There are few people living on these islands and that gives breathing room to a lot of unique fauna. Hopefully the fabled dragons will be able to survive their biggest nemesis- inbreeding. There's only 2,500-3,000 in existence as occupies three islands- Komodo, Rinca, and Gili Motang. The gene pool is considered by scientists as substandard for long term prospects of species survival. Otherwise, they are an economic boon to man, and no one in their right mind would ever go poaching for Komodo. I did not visit Komodo Island itself, but chose Rinca instead. 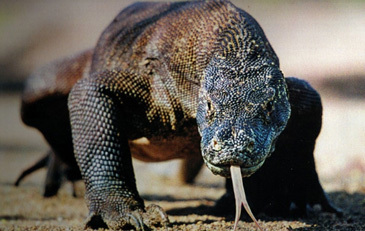 It is much easier to get to and actually the odds of seeing a dragon are much higher than on Komodo itself. On the island of Rinca, for instance, along with Komodo dragons thrive monkeys, water buffalo, and even wild horses. Rinca has only one or two small seaside villages the best I can remember, and the rest is wilderness laced with trails for hiking. The fauna is absolutely unique, as different from the Ujung Kulon wilderness reserve in West Java as the Vermont hills are in autumn to the Olympian rain forest in Washington State. The skies above the Komodo archipelago are home to a large population of majestic sea eagles circling for fish. For the first time in my life I witnessed an eagle spear a fish with great talons extended just starboard of our boat as we came into port at Rinca. Pearl farming is a long-standing industry in the Komodo archipelago. The pearls come in a multitude of colors and a necklace strand as sold with significant mark-up to tourists in Labuan Bajo can cost as little as twelve dollars. Pearl sellers crowd Labuan Bajo’s faux-reggae Paradise Bar. There is little doubt they are obliged to give the bar a cut of their meager profits. In this cluster of over one hundred islands in the Komodo archipelago, maybe five thousand people are found living in a just a few traditional villages. Tourism influences their lives, as they do profit from selling fish and pearls, but tour infrastructure barely exists. It's an overnight venture out to Komodo due to the distance involved. Most everyone who takes the tour from Labuan Bajo to Komodo Island sleeps on the boat as from what I gather there are no accommodations in the village, though I’ve heard otherwise. TransNusa Air has opened up the entire region in the past five years, as their flights serve some twenty airports scattered all over the islands, including six in Flores and two on Sumba. On either end of the transportation axis are the two major flight hubs of Denpasar, Bali in the west, and Kupang, Timor in the east. You can easily catch a daily flight out of Bali to Kupang, and from there catch connections to a multitude of islands such as Flores, Pandar, Alor, Roti, and Sumba. Kupang is ravaged by poverty as is all of Timor. The twenty-five year war that raged there has taken a terrible toll. Timor as well as its even more devastated sovereign neighbor, the young country of Timor L'este, are not developing regions- they are stuck in the nether-category of "fourth world." Labuan Bajo as gateway to Komodo National Park is on the vanguard of tour development in Nusa Tenggara Timor. The second Indonesian Kuta- Kuta Beach as found in South Lombok in neighboring Nusa Tenggara Barat- is next. The transformation held in store for that region is being undertaken on an unprecedented scale as the overall South Lombok resort development takes in a huge swath of land and shoreline of an area that is just this side of being wilderness. For better or for worse, it is tour and travel that is revolutionizing life in the far reaches of Indonesia’s most undeveloped, poorest regions. A Worthy Role Model for the Arab World? Obama's Indonesian Summit -- What Is at Stake?